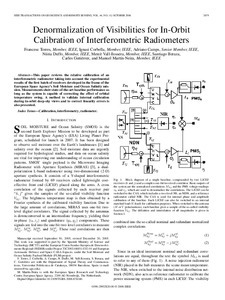 Torres, F.; Corbella, I.; Camps, A.; Duffo, N.; Vall-llossera, M.; Beraza, S.; GUTIÉRREZ, C.; Martín, M.
This paper reviews the relative calibration of an interferometric radiometer taking into account the experimental results of the first batch of receivers developed in the frame of the European Space Agency's Soil Moisture and Ocean Salinity mission. Measurements show state-of-the-art baseline performance as long as the system is capable of correcting the effect of orbital temperature swing. A method to validate internal calibration during in-orbit deep-sky views and to correct linearity errors is also presented.